Guest post by Mary Haglund of Winston-Salem’s star eatery, Mary’s Gourmet Diner. Mary shares her favorite places to eat, drink, shop, stay and be merry in Asheville, NC. People have been asking me about my favorite places to visit in Asheville. So here goes! My favorite breakfast spot is Over Easy Cafe on Broadway. They use all local products & it’s female-owned! It’s really tiny & there’s usually a wait, so be prepared for that. Well worth the wait!! They text you when your table is ready. There are lots of places to shop nearby, so the wait goes pretty fast! My friend James, who lives in Asheville, turned me on to a place where the locals eat in Asheville (there’s a location in North Asheville and another in West Asheville) called Homegrown. Very Rainbow-cafe. (Some of you won’t remember this Winston-Salem institution. Ask somebody over 45!) The menu is a huge chalkboard & you order first at the cash register & then seat yourself. Very earthy-crunchy hippie food, which I like. It’s in a run-down house, very shabby-chic. Nothing fancy, but very tasty, healthy food. Sunny Point Cafe is great! Always busy!! The weekend brunch wait was an hour & 1/2!! So try to go on a weekday. P.S. When in Black Mountain, be sure & check out Blue Ridge Biscuit Company. Excellent!! For vegetarians, you can’t beat Laughing Seed Cafe. They’ve been around a long time & know what they’re doing!! They serve vegan & raw options too. Cúrate wins this category, hands down!! It’s a tapas place, so Curate serves small plates. This is my favorite way to eat! It’s a beautiful space, very busy. They take reservations, highly recommend this or you probably won’t get in. The service is impeccable, the staff is very knowledgeable… & the food!!! Even the simplest dish bursts with flavor!! Not fussy or overdone. Everything we tried was delightful. Our favorite dish was the clams (almejas con verduras al horno). We were fighting over the broth!!! Priced reasonably & worth every penny! I also love Salsa’s. It’s just around the corner from Cúrate. It’s Mexican-Carribean fusion. Spicy & bold!! It’s teeny, tiny. Go during off-hours to avoid a long wait. I’ve been eating here for years & it never disappoints!! Dobra Tea is one of my faves… but I’m a Tea nerd. There are two locations, one in West Asheville & one downtown (and one in Black Mountain). Their staff is very knowledgeable. They have to go to school before they can work there! The Tea menu is a book. I’m not kidding!! It’s amazing!! They cater to alternative, healthy diets. Lots of GF, dairy-free choices & everything is extremely delicious!! Try the “ Medicine Ball.” It’s kinda magical. There are three different seating areas. The first is regular tables, then it gradually gets darker & closer to the floor. You sit & they bring you the menus & a little bell. When you’re ready to order, you ring the bell & a nice person comes to your table. Open late. The other tea service that is notable is the High Tea served at the Inn on Biltmore Estate. You must make reservations. It’s $40 per person, but hey, vacation is for relaxing & indulging, right? My friend & I really loved it. It’s very leisurely, taking about two hours. The view is amazing!! There are three courses: Cheese Plate, Savory Canapés & Sweet Canapés. Each course contains as many as five offerings & the menu changes seasonally. Tiny, tasty food! A great tea selection & bubbly wine is also offered. The service was attentive but not stuffy. There are so many chocolate shops in Asheville!! The fudge at Kilwin’s is phenomenal. Makes great gifts & if you buy two slabs, you get one free!!! For fancy chocolate go to The Chocolate Fetish. Everything is beautiful & exquisite tasting!! There’s lots & lots of great shopping !! We love a clothing store named Charmed. It’s at 46 Haywood St. Probably the best prices on unique clothing. You can get a dress for $20! Expect to find good quality clothes at great prices. Awesome service too. One of my faves is Spiritex. It’s located at 14 Haywood St, just a couple of doors down from Tupelo Honey. Female-owned. All the fabrics are organic, ethically & sustainably grown. The owner designs & produces all the clothing. She has men, women’s & children’s clothing. It costs more, but well worth it. The fabrics are yummy. I own two dresses & I absolutely love them! Super comfy & classic design. They were around $80 each, but will last forever! Avaloo is a female-owned shop at 32A Biltmore Ave. Two ladies own & operate this shop producing handcrafted pieces. They design, sew, dye & sell all items!! You can see them sewing in the back of the tiny shop. It is definitely geared toward the older ladies. Beautiful, comfy pieces. I bought a tunic that I will wear a lot this fall & winter. It was $105. That’s pricey, I know, but I would rather have one beautiful piece made by women I can talk to than a whole cart full of cheap clothes produced overseas by children!!! April Cornell is located on Broadway, across from Over Easy Cafe. If you like kitchen linens, tablecloths & all things floral fabric-y, you’ll go crazy in here!! I got a beautiful tablecloth. The fabrics are outstanding. They also sell clothing for women & children. They’re a little too flowery & flouncy for me, but everything is pretty! Not cheap, but that’s because it’s high quality. Street Fair is jam-packed full of jewelry, hair adornments, funky clothing & socks!! It’s a great place to browse for a while. Good prices. I almost always find something interesting. Wall Street is loaded with great stores. A leather shop, yarn store & accessory store, just to name a few. My favorite bookstore is Malaprops. It’s an old-school, dying breed of bookstore that still thrives in Asheville!!! Always buzzing with lots of people, they have readings & book signings. There’s also a small cafe where you can get coffee, a snack & take a break. The Asheville Bee Charmer truly is charming with all things honey & beeswax!! Unique gifts!! Right down the street from Street Fair. Biltmore Estate is a must-see, especially through October because you get a double-shot of entertainment w/ the Chihuly exhibit (through October)!! It’s breathtaking!! Costco has a two-day ticket for around $45!!!! You have to upgrade to see the nighttime exhibit when they light up the Chihuly glass. I think it’s $25. That’s still the best price I’ve seen. It really takes two days to see everything. Lots of walking. There are many restaurants on the estate as well as a winery, gardens, farm animals, stores, stables, kayaking, biking & historical events. We are lucky to have this so close to home. Go and see a movie at an old theater: Fine Arts Theatre!! For the money, I recommend finding an Airbnb. We stayed in a cute little house w/ 2 bedrooms, a nice bath, living area, dining area, kitchen & deck all to ourselves in a secluded spot. Still only 10 minutes or less from downtown for $78 / night!! 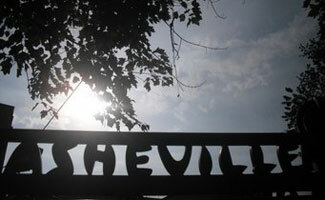 What’s your favorite spot to visit in Asheville?